I have reviewed Bluetooth keyboards before, and this Adesso SlimTouch Bluetooth keyboard is designed for those who like the shorter and slimmer design of netbook keyboards. It is also good for those who don’t have a lot of room in their backpacks as it is not very thick. The WKB-4000BB will work with Windows XP, Vista, and the spanking-new Windows 7. I had a chance to try it out for myself, and I liked what I tried. The SlimTouch Mini keyboard comes with a Bluetooth USB dongle that is so small…how small is it? It is so small, the box had to have an arrow saying “USB dongle” or a new user would not have been able to find it. Yeah, that joke isn’t very funny, but usually those “how (insert adjective here) is it” jokes usually aren’t. For those who want to be free of the mouse as well as a wired keyboard, the SlimTouch also includes a GlidePoint touchpad with a convenient scrolling feature. Adesso boasts that the keys of the SlimTouch have low profile scissor switches for quiet typing, but these keys sounded about as “loud” as the ones on my laptop. Not that the typing of these keys would keep anyone awake, mind you. 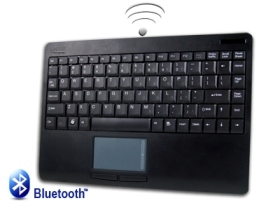 The Adesso SlimTouch Bluetooth Keyboard can be purchased at the Adesso site for about $129.99. It requires two AAA batteries for power, and pairs quite easily with computer or even mobile phone.